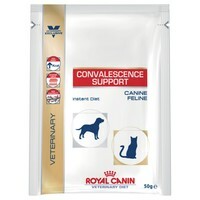 Royal Canin Convalescence Instant Sachets for Dogs and Cats is a complete vet diet feed for the nutritional restoration and convalescence of cats and dogs over 6 months old. Made with highly digestible ingredients that contain a high energy level and a high concentration of essential nutrients, Royal Canin Convalescence Veterinary Diet is suitable for dogs with Anorexia, Malnutrition, Tube Feeding, Post-Surgery Recovery. Great usefull food. We have elderly ferrets and an elderly cat using this to keep weight on alongside soaked biscuits food. Have used many times as a supplement post surgery, for rescue animals who have been starved and for unwell animals needing gentle food. So useful. Very useful to have in the house if you are a ferret owner, as this can be used as a replacement food if your ferret is poorly and struggling to eat, or as a means to hide the taste of any other medicine. Simply mix 1 heaped teaspoon full with app 15ml warm water and serve warm (not too hot) either in a bowl, or if the ferret is too poorly using a syringe. Note - this should only be used as a supplement for poorly ferrets and not as a daily treat. I purchased these sachets for my 16 year old cat that needs to take milk thistle and gain some weight. I just mix the milk thistle into the powder and syringe the liquid into his mouth.I found this product gives him just the boost that he needs. This is great stuff. I am using it for a poorly ferret and as you can mix it to a thin consistency it's ideal for syringing if an animal is refusing or unable to eat from bowl. I mix his meds in and he wolfs it down.